The “Morning Pens Links” are one of those things that have evolved a bit… you will still be getting them, however they will now be coming in the form of a daily “Around the Net” column. As you know, launching a website is always a work in progress. There are things that you like, things that you don’t like and things that evolve along the way. The “Morning Pens Links” are one of those things that have evolved a bit… you will still be getting them, however they will now be coming in the form of a daily “Around the Net” column. 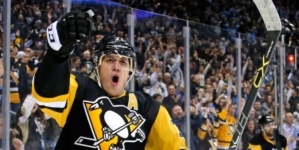 We will still focus on a number of links that bring you the 411 on YOUR Pittsburgh Penguins, but will also feature some other items from around the league. Also, if you stumble across something that you feel would be of interest to other hockey fans during your daily surf, please do send it along to me here! Here is Rob Rossi’s take on the game. He focuses on the frustration of the team in losing these games to the Caps…also the comments that I shared earlier from Brooks Orpik. Here is a look at last night’s game from the other side of the wall. Tarik El-Bashir gives us the take from the Capitals room…Mike Knuble had never been in the situation that Bruce Boudreau put him in last night…he had never netted a shoot out goal before and was blown away that his coach chose him with the game on the line. Jose Theodore is a former NHL MVP, but he hasn’t looked like much of an MVP over the past few seasons. That all changed this year… he has been unbelievable for the Capitals and used an injury to Semyon Varlamov to lock down the Caps starting job. He is also making a strong case to be the Caps playoff starter… here is NHL.com’s Dan Rosen on Theo. Here is a look at some local folks who are trying to stop the demolition of the Mellon Arena. Not sure it is feasible to keep it standing once the Consol Energy Center opens, but if they can find a way, why not keep the old barn? 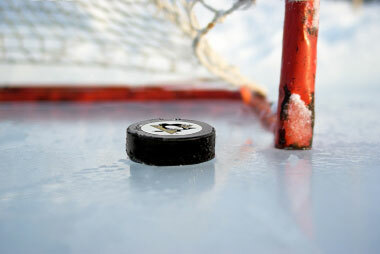 Winter Classic coming to Pittsburgh? Former Penguins’ defenseman, Andre Ference has been signed to a three year contract extension by the Boston Bruins. The San Jose Sharks have done a nice job of finding undrafted college talent to stock their organization with. Their philosophy is that there are diamonds in the rough if you are willing to do your due diligence…it is a second draft to them. 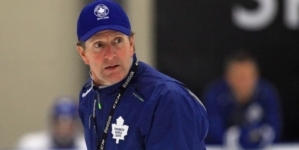 Former Capitals head coach Glen Hanlon was just named to the same post for the Slovakian National team. The Nashville Predators have announced that they have reached their critical attendance mark of 14,000 per game, which has them in position to receive a $10,000,000 dollar revenue sharing payment from the National Hockey League. Last but not least, I recently did an email interview with Patrick Hoffman of Kukla’s Korner. Patrick and I worked together at Hockey Buzz and he was gracious enough to want to do this sit down… some of the information you might already know about me, but there is definitely some new stuff on my history in hockey blogging etc. Thanks Patrick! It would be very surprising if next year’s Winter Classic ended up in Pittsburgh. 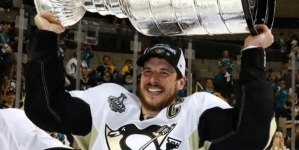 It would show that Bettman is clearly trying to promote its poster child in Crosby. Definitely not a fair choice to the rest of hockey fans. I thought it was almost a lock that the next Winter Classic will be in New York. I would love to see Devils-Rangers or Rangers-Islanders. But from what I hear they try to use separate market teams. Correct me if I’m wrong. Very pleased with the effort last night. Not too concerned about the shootout as I am more in playoff mode and that obviously isn’t a part of the playoffs. First game in a while that the Pens played a pretty solid playoff style game. Still very concerning that one player (we all know who he is) can be such an Achilles heel and still get the minutes he is getting. Thought it was funny the Caps color guy said that he was the Pens best defensemen tonight. I think it is time to reinstate Kennedy to his 3rd line spot. Guerin needs to play top 6 or he is not playing the role he should be in. I think that Gogo and Mckee should make themselves comfortable in the stands and have Lovejoy play the last stretch of games to see what he has. I think that he is a better option at this point. Add a healthy Malkin and Gonchar to the mix and I think that they have a shot at the whole thing again. I was questioning that in the past few weeks. Last night showed to me they still have it. Andrew in a league that is fighting to be noticed in the states why wouldnt they showcase their two biggest superstars fair or not. It benefits the league as a whole where people will hopefully start to get interested in other teams as well. Its not about fair, its about business. I would have to say that good business is displaying your whole array of talent rather than just focusing it on your few top guys (Malkin & Crosby). Good businesses don’t necessarily spend most of their effort marketing their top sellers. If anything, those top guys sell themselves. There are plenty of other extremely talented players in the league that deserve some attention. I dont think you can put it down to Malkin and Crosby, if you look at what Gunner is saying it really is OV and Crosby they are trying to show case. Always trying to show case. Maklin and Semin are always along for the ride. You are right there are other players that should be show cased but these two players right now are the leagues ‘Magic v Bird’ and they should use it for all the marketing value it is worth. As an overseas Penguins fan its great for me because it means easier access to games of my team. its not great for other teams fans though.